Norwegian all-rounder MARIUS DANIELSEN proudly presents the second single of his upcoming new album "Legend of Valley Doom - Part 2"! The highly anticipated second part of "Legend of Valley Doom" will be released via Crime on November 30th 2018. Be prepared for breathtaking songwriting performed by some of the best metal musicians of our time and guided by a fantastic storyline. This is symphonic and epic Power Metal at its best! German Death & Heavy Metal Innovators CHAPEL OF DISEASE have revealed a video for their new track "Song Of The Gods"! The band's new album, "...And As We Have Seen The Storm, We Have Embraced The Eye", will be released on 23rd November 2018 via Ván Records. Polish Black-Deathers IN TWILIGHT’S EMBRACE have unleashed a special release - “Law” is out now! Released by the band in cooperation with Left Hand Sounds a year after the lauded fourth full-length “Vanitas”, “Lawa” is yet another step into the sonic realm of Metal Śmierci, a rift between the fundamental principles of black and death metal, yet this time taken even further, into more atmospheric, idiosyncratic and surreal directions. It’s an exorcism, during which the spirits are unbound into a November night and dance among the living. Come, join the celebration of the weird! LP release will follow in early spring 2019. Swedish Metallers THIRD STORM have unleashed another new track of their upcoming debut full-length "The Grand Manifestation"! "The Grand Manifestation" will be released on 9th November 2018 via Dark Descent Records and features a well-crafted blend of Black, Death, Doom and Thrash Metal. Brutality, heaviness, speed, melodies, chaos, doomy stuff, blast beats - everything excellently performed in its pure blackest form. In early 2015, WHILE HEAVEN WEPT mainman Tom Phillips had to regrettably pull the plug on the band’s European tour in support of their latest studio album, “Suspended At Aphelion”. The decision led to Phillips’ unexpected retirement from the metal scene, effectively putting the revered doomsters on ice. However, Phillips and his bandmates have long sought to make amends to the European crowds who have so strongly backed WHILE HEAVEN WEPT over the years. Now, as 2018 draws to a close, the most recent incarnation of WHILE HEAVEN WEPT that started with 2009’s classic “Vast Oceans Lachrymose” will play its final shows together on a run of European dates that begins November 16 at Germany’s Hammer Of Doom festival. The “Vast Oceans Lachrymose” lineup — rounded out by bassist Jim Hunter, vocalist Rain Irving, second guitarist Scott Loose, keyboardist/harmony vocalist Michelle Schrotz and drummer Trevor Schrotz — have been holed up in a Virginia rehearsal room putting together a setlist that is not only representative of the latest era of WHILE HEAVEN WEPT, but the band’s storied past as well. According to Phillips, some of WHILE HEAVEN WEPT’s most memorable shows have taken place on European shores, including their 2010 appearance at Hammer Of Doom alongside Irish metallers PRIMORDIAL, which was not only Irving’s third show with the band, but also where the “Triumph: Tragedy: Transcendence” DVD/live album was recorded. While these European dates signal the end for the “Vast Oceans Lachrymose” era of WHILE HEAVEN WEPT, it does not mean the end for the band. Phillips says there is an entire album of unfinished material that sits between “Fear Of Infinity” and “Suspended At Aphelion” in which he may look to finalize at some point. German Death Metal Giants SULPHUR AEON announce their new album! "The Scythe Of Cosmic Chaos" - to be released during winter's solstice, the 21st of December, 2018 via Ván Records on double vinyl record, compact disc and via the known digital channels. "Yuggothian Spell" is the climax of Lovecraft's "Haunter of the Dark" set to music, as simple as that. Underlined by the song's constant change between storming riffs and an almost doomy pace, it represents the protagonists' descent into madness, in manic fear of what stares at him from the darkness of that ruined church, where he accidentally summoned the ancient evil, haunting him now. 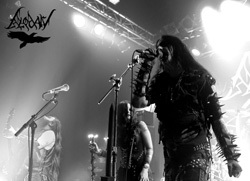 Danish Black Metallers BLODARV have inked a deal with Soulseller Records! The band's upcoming full-length "The Illuminating Darkness" will be released in spring 2019 on CD, 12" Vinyl and digital formats. BLODARV recently gave an insight about what to expect from the album by premiering the track “A Dark Trail Of Death" which is available at the following locations. More info about "The Illuminating Darkness" will be available soon! South Tyrol based Death Metallers ORGANIC have unleashed another track of their upcoming debut full-length "Carved In Flesh"! "Carved In Flesh" will be released via Testimony Records on 16th November 2018 on Digipack-CD (limited to 500 copies, handnumbered), Tape, limited LP including 2 bonustracks (100 x transparent blood red, 200 x black) and in digital versions. It was recorded and mixed at Sound Control Studio with Lukas Flarer. Do you wanna have a good time? Are you ready to rumble? Back from the 70's, here we are! Their first release, a self-titled mini album, will be published on 11th January 2019 on CD, 12'' LP and in digital formats. It features guest appearances by the entire BLUES PILLS band, whose bassist Zack Anderson even recorded the four songs. Inspired by MC5, James Gang, Grand Funk Railroad and many more, KOMODOR invites you to their journey through rock'n'roll! Ghouls and Gorgons! Sirens are calling! German Death Metallers ICHOR return with their fourth full-length entitled "Hadal Ascending"! The album will be released on 7th December 2018 via Unholy Conspiracy Deathwork (CD, digital) and Wooaaargh Records (vinyl). "Hadal Ascending" delivers ICHOR’s known blend of US Death Metal influenced guitar work and freezing cold Black Metal parts, yet offers more variation and dynamics then ever before. Thematically it links to the band’s previous albums "Benthic Horizon" and "Depths" as the fictional story of a devastated and hate-filled deep-sea world full of creatures and mystical beings continues. "Hadal Ascending" was recorded, mixed and mastered in Hertz Studio / Poland (Behemoth, Hate, Decapitated, Vader). The cover artwork was painted by Par Olofsson (Aborted, The Faceless, Immortal) and Mentalporn (Origin, Immolation, Hate, Behemoth) graced the album with an elaborate layout.